This year, the London Indian Film Festival screened it’s first Pakistani film, Josh – Against the Grain, by Iram Parveen Bilal. The Pakistani film industry doesn’t produce many films, most go unnoticed, and the few that I have seen, I tend not to like very much, so with Josh, I was pleasantly surprised, and almost relieved to find it’s actually very good. Fatima (Aamina Sheikh) is a teacher living in Karachi, and is quite comfortable thanks to her lawyer father. Her mother died when she was young, so she was brought up by her nanny, Nusrat-bi (Nyla Jafri). Nusrat-bi doesn’t return after taking a few days holiday back to her village, and concerned about what might have happened, Fatima goes to find her. When she gets there, her live changes as she becomes aware of the issues of villages like this in her own city, and is determined to make a difference. The cast is made up of mostly actors who appear in Pakistani TV serials, so there will be many familiar faces to some audiences. Like TV actors from anywhere in the world, there are good ones, and some terrible ones, but the director, Iram Parveen Bilal, manages to get at least decent performances from all of her cast. Aamina Sheikh, the lead, is impressive, but again I’m sure most of that credit goes to the director. The male cast tend to lack a bit of screen presence, but then it is a film mainly about the women of the story, so maybe that’s about keeping focus on the right characters. The film doesn’t always have a very cinematic look, and I think Pakistani films have to be quite careful of this, because the production values of their TV serials are pretty good, they run the risk of looking too similar. In the Q&A that followed the screening, Iram Parveen Bilal said that her main focus is performances, not the shots or the look of the film, which is fair enough, and she does get good performances out of her actors, but if she’s not concerned about making her film look like a cinema feature, I’m not sure if she is justifying enough why she chose to make a feature, especially since very few Pakistani films get a wide audience. The music to the film is pretty good, and also features a few songs, which are pleasant but ultimately unnecessary. They don’t take anything away from the film though. Despite it’s at times, almost-TV look, from a technical aspect, it’s very well made, and depicts Karachi as well as anyone ever has. I don’t doubt there were a lot of issues when shooting a film around Karachi, especially with security, and the fact that it’s a female filmmaker, so considering all that, she’s done an excellent job. It doesn’t shy away from the fact that it’s a social message film, and it shows and says what it wants to without getting preachy, which I really appreciate. There’s nothing I dislike more than over-preachy cinema. It is also very focused in what it’s issue is. The last Pakistani film I saw was Shoaib Mansoor’s Bol, and that was so confused with what it wanted to say, what social issue in Pakistan it wanted to address. Josh is much clearer, and I think a greater achievement in filmmaking. I never know if Pakistanis will bother to go see their own films, but everyone else should certainly give it a chance, It manages to do what Iram set out to do, to inspire people to make a difference. 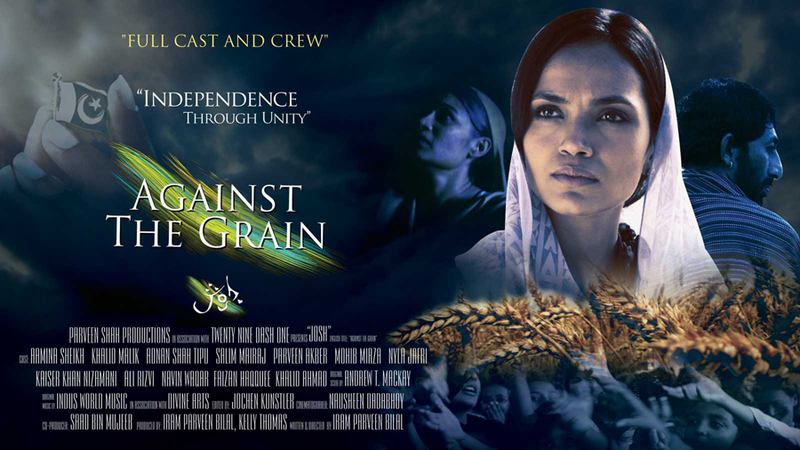 Josh – Against The Grain is doing the festival rounds, and releases in Pakistan on Eid, 8/9th August 2013. This entry was posted in Festivals, Reviews and tagged Aamina Sheikh, Adnan Shah, film, Iram Parveen Bilal, Josh, Josh Against The Grain, Kaiser Khan Nizamani, Karachi, Khalid Ahmed, Khalid Mirza, Khana Ghar, LIFF, London Indian Film Festival, Mohib Mirza, Nyla Jafri, Pakistani, Parveen Akber, Review, Shoaib Mansoor, Urdu film by maahin_a. Bookmark the permalink.